COCHISE COUNTY, AZ (Tucson News Now) - The Fort Grant Wildland Fire Crew has responded to a dozen brush fires in southern Arizona since March 1. Supervisors lead the team of 18 inmates who are qualified in fighting fires and fire prevention. "It was one of the best decisions I've ever made," said squad boss Mark Harper. "To put it bluntly, it's been a life-changing experience for me. I know a lot of the guys out here feel the same way." Harper applied to the program just over a year and a half ago. He passed the screening process, completed the training and earned a spot with Fort Grant. The first inmate fire crew in Arizona, Fort Grant is now one of four that covers southern Arizona. There are twelve crews across the state, so inmates with Fort Grant know they've worked hard to be on the team and they're not going to waste the opportunity. "To not be a part of something this great and this awesome, I couldn't fathom that," said squad boss Richard Jones. "I would try and do everything I need to do to be a part and have one of those seats." Jones joined the crew five years ago. He's set to be released in two months. He's making plans for the future but won't forget about the crew that's taught him a skill set that could carry over into a new career after prison. "It's kind of bittersweet leaving the crew in the middle of fire season, especially June," he said. "Hopefully if the opportunity presents itself then I'll go directly into firefighting when I get out and experience what it's like out of state and fighting fire in other places, not just southern Arizona." Jones, Harper and the rest of Fort Grant spent the past two days clearing brush around a home in southern Cochise County. The grass is cut low, the limbs are trimmed high and everything that's removed is tossed into the wood chipper. Salvageable pieces of wood are given to the property owner for firewood in the winter. 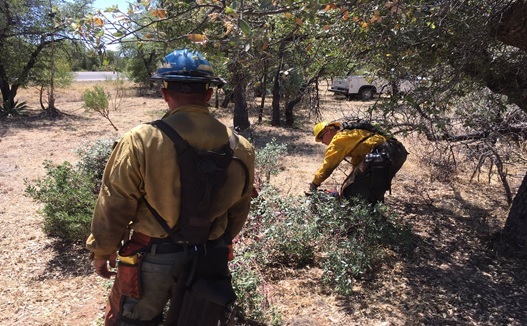 Each crew is supervised and coordinated through the Arizona Department of Corrections and Arizona Department of Forestry and Fire Management. Crew Supervisor Lehi Vizcaino said he doesn't think twice about the criminal history of his team. He said anyone who doesn't cut it is booted from the crew. "If one thing they're going to learn, they're going to learn how to work," he said. "They might now work in fire when they get out, but they will be a productive member of the community, that's my guarantee." A guarantee that the inmates take to heart. "We've made some poor choices but it's never too late to rectify those choices and give back to the community," said Harper.